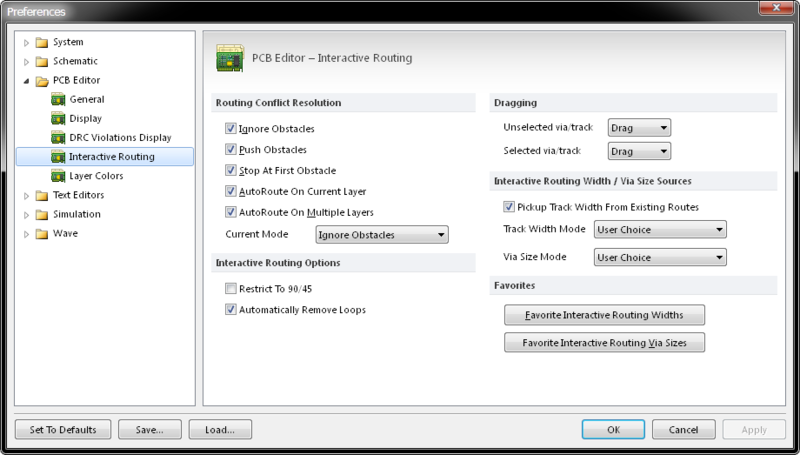 The PCB Editor - Interactive Routing page of the Preferences dialog. The PCB Editor – Interactive Routing page of the Preferences dialog provides options relating to the functionality of the Interactive Routing feature within the PCB workspace. The PCB Editor – Interactive Routing page is part of the main Preferences dialog (File | ) and is accessed by clicking the Interactive Routing entry under the PCB Editor folder, in the left hand pane of the dialog. Ignore Obstacles - Select to have the interactive router allow the track to pass through obstacles while routing. Push Obstacles - Select to have the Interactive Router move existing tracks out of the way while routing. This mode can also push vias to make way for the new routing. If this mode cannot push an obstacle without causing violation, an indicator appears to show the route is blocked. Stop At First Obstacle - Select to have the Interactive Router stop routing when it encounters the first obstacle in its path. AutoRoute On Current Layer - Select to enable autoroute on current layer. AutoRoute On Multiple Layers - Select to enable autoroute on Multiple Layers. You can switch routing modes on-the-fly using Shift + R during routing. Automatically Remove Loops - Enable to automatically remove any redundant loops that are created during manual routing. This allows a connection to be re-routed without having to manually remove redundant tracks. When loops are needed, such as with power nets, the Remove Loops option can be toggled for a selected net by editing its net property from the Edit Net dialog via the PCB panel. The Remove Loops local setting for the specified net overrides this global setting for the same net. Configure the Dragging options to allow direct dragging, or require selection first. Unselected via/track - Set the default behavior of dragging an unselected via or track to be either a Move or Drag action. Selected via/track - Set the default behavior of dragging a selected via or track to be either a Move or Drag action. Pickup Track Width From Existing Routes - Enable to use the existing track width when routing from an placed track. That is, even if the current routing width is different to the existing track, the existing track width will be adopted when you continue the route from it. User Choice - With this mode enabled the width is determined from the width selected in the Choose Width dialog - accessed by pressing Shift + W while routing. Rule Minimum - With this mode enabled the design rule minimum width defined for the current net will be used. Rule Preferred - With this mode enabled the design rule preferred width defined for the current net will be used. Rule Maximum - With this mode enabled the design rule maximum width defined for the current net will be used. User Choice - With this mode enabled the via size is determined from the size selected in the Choose Via Sizes dialog - accessed by pressing Shift + V while routing. Rule Minimum - This mode uses the minimum via size rule. Rule Preferred - This mode uses the preferred via size rule. Rule Maximum - This mode uses the maximum via size rule. Favorite Interactive Routing Widths - Click this button to pop up the Favorite Interactive Routing Width dialog. Favorite Interactive Routing Via Sizes - Click this button to pop up the Favorite Interactive Routing Via Sizes dialog.